I’ve got two articles on the Thales Australia EF88 and the new Madritsch ML40AUS grenade launcher assembly (GLA) in the works. The first will appear in the next edition of On Duty Magazine (which is free for AUS military personnel, LEOs, paramedics, and other front line professionals) and a second, slightly more technically-focused piece, will appear in an international publication a little later in the year. 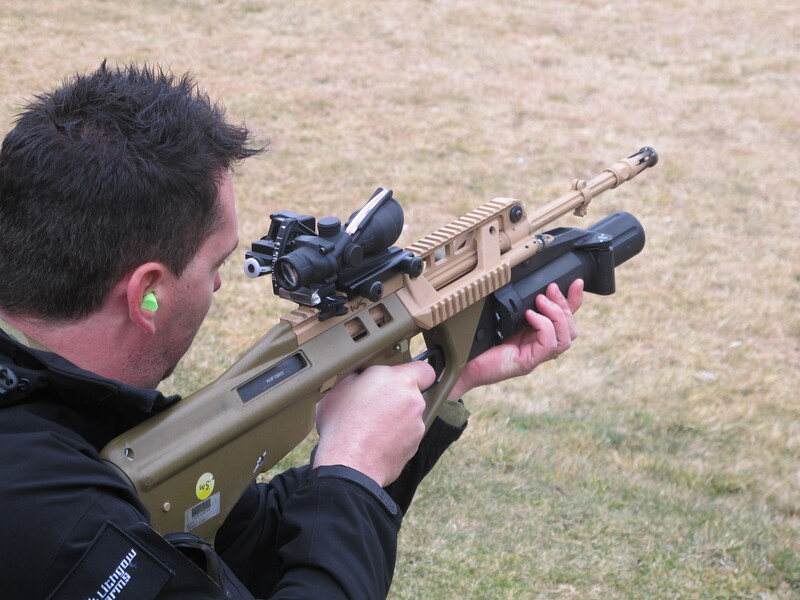 One of the great things about the new EF88 is the ML40AUS grenade launcher designed specifically for the rifle. The ML40AUS integrates directly with the rifle, allowing the GLA’s trigger to sit within the EF88’s trigger guard. Thales have also designed a new quadrant sight for the GLA, and the two together are significantly better than the current-issue RM Equipment M203PI / Knight’s Armament quadrant sight combo. More info on the ML40AUS will be in both of my upcoming pieces. In the meantime, here’s some high-speed video of the GLA being fired. The first video shows an M433 HEDP cartridge being fired, and the second a M583A1 White Star Parachute illumination cartridge. Update 26/10/2012: You can see some footage of the EF88 and ML40AUS being fired here. Footage courtesy of Thales Australia. Image copyright: N.R. Jenzen-Jones.